kabobs ... and cook them vertically! and Gourmet Cookbook -- NO ROASTER INCLUDED. This kit has it all ... and is a fabulous bargain! warming, newlyweds -- from new cooks to chefs. NOT JUST A CARVING BOARD! trough grooves collect all the natural juices. One side has three inner circle rings to fit the bases of all sizes of our vertical roasters, holding them in place while you carve. Deep troughs catch all the natural juices. The other side is flat for normal chopping. 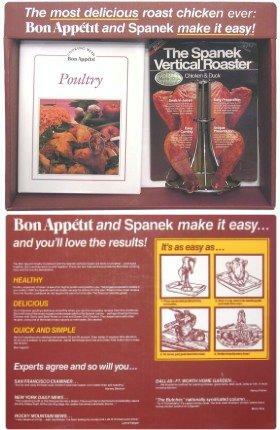 The original Spanek Vertical Chicken Roaster, the Bon Appétit Poultry cookbook, and a slice of history — in a presentation package. Classic! Almost gone ... get yours now! $69.95 while they last! Back in 1984, we got a telephone call from Bon Appétit Magazine. A chicken recipe by Lynne Kasper, at the time a Bon Appétit food writer (just a couple of years before she was named one of America's 12 best chefs by the James Beard Foundation), had been judged the single best recipe over the last ten years of "best recipes" from the magazine in this category. "And we thought, since Lynne used your vertical roaster to create this fabulous recipe, maybe, Mr. Spanek, you'd be interested in creating a package of our cookbook and your roaster." That wasn't a hard decision at the time — we were honored!